I elected to keep it as a pen by bringing the top edge down and the bottom edge up to a new point. It is a neat little knife with an unusual tang stamp that you don't see every day. OC that looks GREAT!! Carry that one with pride!! Nice blade repair on that nice little pen knife. It is back to being a valuable knife again. Lee, cool sleeve board shadow pattern pen with wonderful etch! Very nice Lee,good looking knife. That’s a good older maker, I have never found an Empire yet but always looking. That's a beauty there, Lee. Very nice Lee!! Congratts on a beauty!! KAW, i think your small Ulster pen knife has tortoise shell handles. The celluloid 'stuff' looks brighter. And BWT: "I have never found an Empire yet but always looking." i am surprised by this. 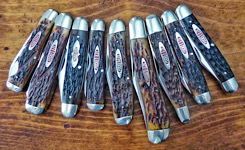 Empire Winstead knives are seen on ebay fairly regularly. I just mailed off a few yesterday to a friend in USA who will ebay them for me. kootenay joe wrote: KAW, i think your small Ulster pen knife has tortoise shell handles. The celluloid 'stuff' looks brighter. kj... Wow... that would very cool if true as it would be my first and at present only knife with tortoise shell handles. My only Empire is an single blade electrican's knife with wood handles... totally at the other end of the spectrum to such a eloquent MoP gentleman's pen. Here's a F Herder & Son(s). Shadow pen. Apparently the "Keys" stamp was used after 1927. It has the incredibly advantageous catch bit that allows for the long main blade. A half stop on the pen blade. Unsharpened and unused at just a smidge under three inches. One of the cleanest knives I own. I wonder where it's been.